Widower Ed (Stephen Payne), an engineer, gathers his three grown sons for Christmas, and amidst much sophomoric horseplay and f-bombs, a disturbing family dysfunction emerges. The turning point occurs when son Matt (Paul Schneider) unaccountably starts to cry, as the guys scarf down their Chinese takeout meal. Matt is a Harvard graduate and a high minded idealist.for whom great things had once been predicted Now he lives at home, a virtual caregiver for his father, and content to work at a menial clerical job for a community group. His brother Drew (Armie Hammer), a successful novelist and teacher, sees in Matt’s inaction a lack of self esteem, and strongly pushes him to therapy. Divorced banker brother Jake (Josh Charles) is certain Matt has eschewed the American dream and has simply decided not to sell himself. Ed, for his part, believes Matt may just troubled by the debt of his student loan. Such is the premise of Korean-American playwright Young Jean Lee’s play, seen at the Public Theater in 2014. 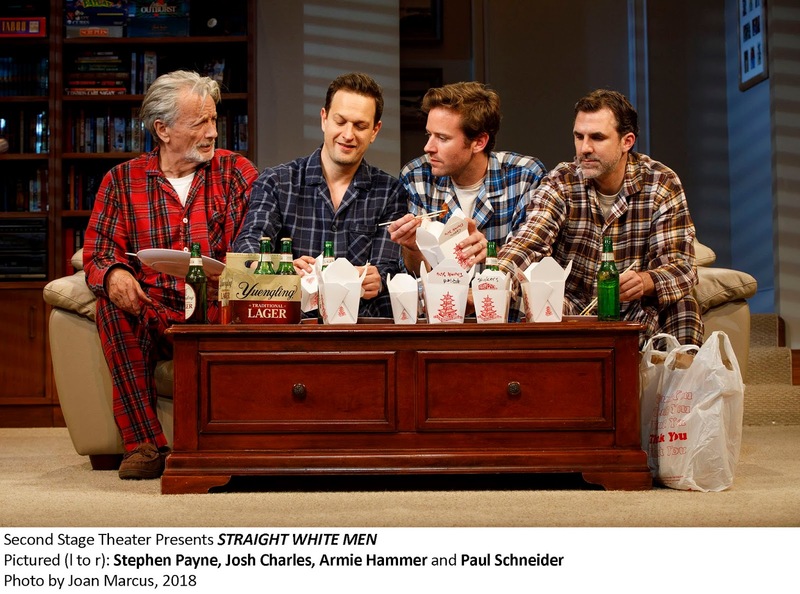 With its testosterone fueled characters, this might almost be mistaken for a Sam Shepard play were it not for the themes which are uniquely Ms. Lee’s. For gradually, it emerges that all three are troubled by their lifestyles which have come to them through what they’ve been brought up to recognize as white privilege. Their late mother had even invented a Monopoly-like board game called “Privilege” to drive home that point. Still, when Matt shows indifference to chasing success, his siblings and father, for all their liberal leanings, are deeply displeased. At one point, quite amusingly, Ed and Jake role enact an interview situation so Matt can learn how to market himself, one of Lee’s most cleverly written scenes. 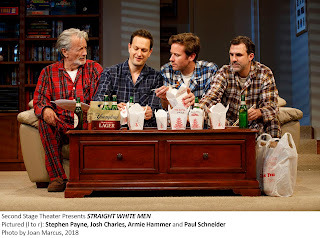 “Straight White Men” does, at times, seem patently didactic, but thanks to the sharp writing, and persuasive performances, you’re absorbed, and though some suspension of disbelief is needed, one accepts these characters as a real family. 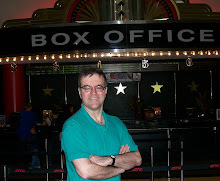 Getting the play off to an intentionally off-putting start, patrons enter the theater to the blaring sound of female rap music (sound design by M.L. Dogg) which is mercifully silenced by the entrance of trans performers Kate Bornstein and Ty Defoe who acknowledge the disorienting sounds and set up the premise of the play to follow. Likable as they are, this framing device seems utterly gratuitous. Anna D. Shapiro directs with a sure hand. Faye Driscoll’s choreography and Schall’s fight direction are tops as these characters are intensely physical. Todd Rosenthal’s living room set, pink bathroom visible upstage is totally convincing. Suttirat Larlarb’s costumes -- right down to the special Christmas pj’s that Ed insists everyone wear for sentiment’s sake -- are savvily character-defining. Donald Holder’s lighting neatly delineates the three scenes.